We did the exact same thing to ring in the New Year! Your new year sounds truly perfect! : ) And I keen on getting healthier this year too - I so want to start running again! Happy New Year! And good luck with your goals. I think the trick is to set attainable ones so that you don't lose spirit. My main goal this year is to conquer my fears and insecurities, especially the ones that have been holding me back from achieving my dreams! such beautiful photos! you two are both so adorable. happy new year & best of luck with your resolutions! I hear you! I'm not really interested in making any new biz goals this year because I decided that what I really, really want is more time playing with my kids. SO. I'm going to attempt to be more creative about things we can do together (especially since we homeschool); I've haven't taken enough photos of them in the last 2 years either- that's going to change; and I'm going to try and take more walks + fit in some exercising. Looks like you and Hope had a grand old time! Definitely want to spend more time with friends in the new year! They mean so much, but it's just so hard for all of us to hang-out with each others because of unalterable schedules. Working with them to create a 'Girls Night/Day In/Out' that will be perfect for all of us. Wish us luck! Oh, and I hope you and your family have a wonderful new year, as well! The pictures of you and your daughter as just lovely! Good luck with all of your goals! My hubby and I are in the process of maybe buying a house...waiting for all of the paperwork to go through. It takes forever!! Cliched things are cliche for a reason, and I think your goals are stupendous! And these photos are too cute. My New Year's Eves are always quiet, with a beautiful meal with my beautiful 7 year old daughter and my family...Just the way I like it :) Resolutions: More yoga/pilates tapes, walking, Less computer/slothing, More reading, More resting/downtime, less feeling the need to keep up with activity or going places all the time, More one on one with my daughter, more creative collaborating with my daughter, More courage and strength to continue my path, more healing, less self-doubt. Happy New Year! Sweet and to the point. Very good list! I love your list! I made a to-do list this year instead of resolutions. I'm calling it 'project 2012' - I'm pretty pumped! I'm Jenna, pretty new to the blogging word in terms of my own blog, but have been reading many for a few years now! I have wrote a list of Goals i wish to achieve this year. thats just to name a few but I really hope I can achieve some if not all, look forward to keeping up with your blog, your little family seem adorable. Love these photos! Y'all are so adorable. My goals: work out 3 times a week (I'm right there with you! ), more me-time, learn to say no when I don't have the capacity, really go for my dreams - no matter what. Good luck with yours! You inspire. you are so darling! and so is your daughter. love love your new years resolutions. 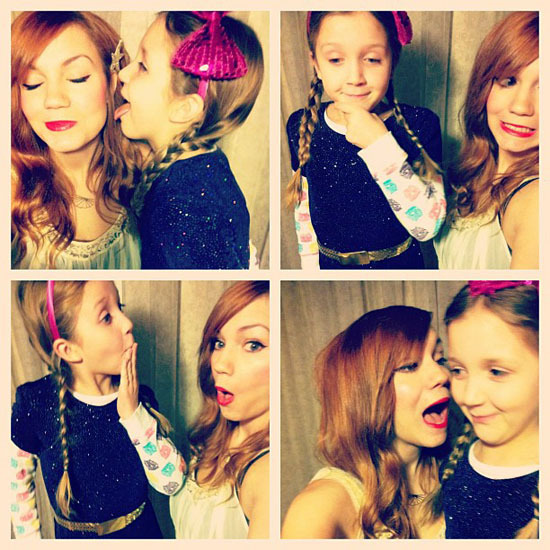 I love the new years photobooth pictures of you and Hope! Awe! It looks like you still had a fantastic new year! Your pictures are adorable! You have some great goals for the coming year! Wishing you the best! Sounds like my kind of New Years Eve!